Take on any trail conditions and win with the Ambush. You’ll get supreme traction, stability and control – with minimal roll. Be ready for the toughest course: choose the Ambush. Ready for all types of cross country and motocross terrains. Durable 4-ply rating construction provides puncture resistance and reduces tire roll. Knobs extend across section width for maximum traction and control. Directional front tire offers predictable cornering with straight-line stability. Great race tire for a great price. Plus I think the design is pretty cool. This is for my 2010 Polaris Outlaw 525S, a few of my friends have them, ive been running the STI Tech4, which I love because they are 6ply. Thought I would give these a try now that I need some new ones. Ton of grip, wear is as good as my STIs, looks and fits great on my alba beadlocks. Will review again after end of season. These tires are awesome, put them on my sons trx90x for xc racing and man, what a difference on corner bite and grip! Son feels more comfortable going in to a corner at higher speeds. The over all handle out on the track has made a huge difference for him compared to stock tires! Well needed for my 05 Bombardier 650. They look great on the quad and can’t wait to put time in on em. I purchased two shirts, a new flag and goggles. This website only sells quality gear, I’m most positive these tires will perform greatly. I drive in the desert with my quad to the Colorado River. These tires have the tread I need with the price I was comfortable with. CST Ambush Tire on my LTZ-400 feels great and is holding up well so far. Great looking tire with versatile a/t tread. Installed on the rear. Great bite on hard packed or soft clay. Tread wear seems to be good. These tires have performed well for me. I have no complaints about this product. They seem to be of good quality and comparable to the similar higher priced tires, but at a more affordable price. Put on a RZR 170. They are awesome. 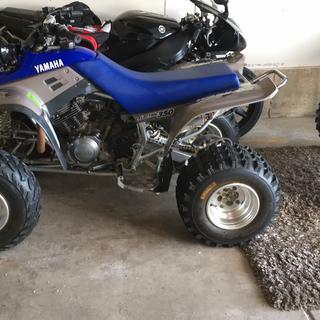 I am very happy with my purchase from Rocky Mountain ATV. The tires I purchased are perfect for my son's quad. Delivery was on time. I will purchase other items from them again. I love these tires! I've used them in the woods, in a field, and on a track. I get great traction everywhere I go on these. The tread seemed to show wear pretty quickly, but I haven't been easy on these tires. When the time comes, I plan on replacing these tires with another pair just like them. Super soft and grippy. These tires hook up very well but are way softer than stock and I can tell they will not last anywhere near as long. Good tire for the price. I'm going to put it on a blaster when I find 1 for my daughter. A good value and they perform well. I would definitely buy again. I had a great experience with these tires. I was riding with a bunch of four wheel drives and side by sides with no issues. Great set of tires for a great price! Taken them out on sand and a rocky terrqin. So far so good. Super grippy and handles really well. The look of the tire when mounted and on the quad is lees than desirable. 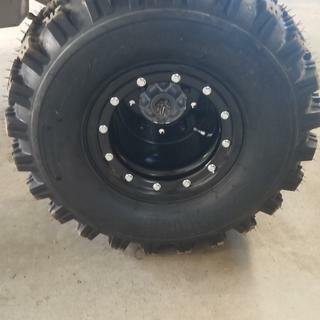 So if you are into the looks of your quad more than the cost, this tire is not for you. cant beat the value after a few months of mixed riding they are showing wear but they are awesome !!! Bought these for our sons Yamaha Raptor 125, He loves the way the hook up & the tread life is awesome. Will buy more of these. purchased these for a Christmas gift, our son loves these on this 300 ex. I also had a set on a Honda Recon they do great on all terrain types. I would by again tomorrow if I needed tires. Thank you Rocky Mtn. I got these toward end of season. These Are great so far hook up in dirt, pavement, sand (pretty good) So far they seem to be Golding up well. Easy to install by yourself and the sidewalks seem pretty sturdy. Great value. Tires hook up great on hard pack surface. Deep lugs for good grip in loose dirt. Tires are holding up good mounted on a KTM 450 xc. Would recommend. Tires have held up very well so much we have ordered sets for several friends and everyone has liked them. Would recommend these tires for all Mx riders. 1st we bought the tires because they sponser ATV Mx Nationals 2nd we bought for price for our practice bike but have found ourselves using as our primary race tire. Happy with price and functionality of these tires. They have been used on dirt/sand/rocks and all the in between stuff. Very happy with the grip and durability of the tires. Have used for 1 season and they don't appear worn. I was having a very hard time find the right size tire for my kids 1998 Kawasaki 220, A neighbor told me about RM, and I'm so glad he did, they were great to help me out knew just what i was talking about, shipped when they said and arrived on time. Awesome tires on a warrior. Hook up great and are very durable. 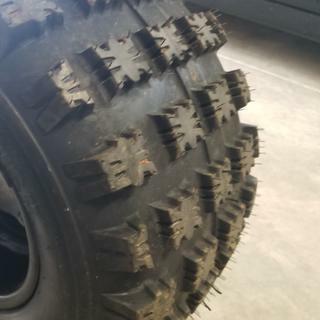 These tires work great here in all sorts of terrain exept snow drifts lol had to try.but for all the more they cost and how they grip i will def be buying another set for the front and rear. These tires are great! They pick up nice on the trails, are lite, and provide a great alternative to mudder tires. awesome tire for the money! Fast shipping, Will purchase through rocky mountain again! I've ran these on a little Honda 250ex for the last year in coastal North Carolina. They do great on almost every surface, including muddy sand. They seem to have about average wear and grip for the style of tire. Not the best tire out there, but for the price, you can't complain. Please can you tell me the exact specifications of this tire? For example, is it radial ply or biased ply?what is the weight of the tire? etc. 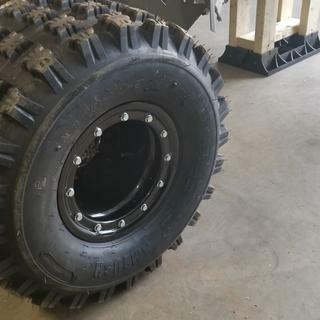 Would these be a good tire for hard desert condition? BEST ANSWER: Work real good in sand. Put a set on my daughters 250ex and she really likes them. Not sure you can do better for the price point! Was just using these in Nevada. Did great in the loose dirt and getting over the rocks. 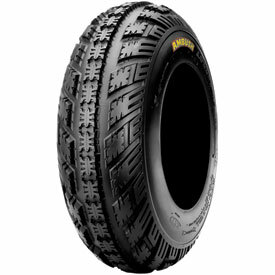 The ambush tire it sale 1 by 1 or in pair of 2? BEST ANSWER: Price is for one(1) tire. What is the speed rating for these tires? i need at25x11 x9 can you help me? BEST ANSWER: Unfortunately, we do not have any tires available in this size. I apologize for the inconvenience. How do the handle in very sandy conditions? Can I fit a 20x6x10 tire in a 10x6 wheel ? BEST ANSWER: Yes, the last number of your tire size indicates the size wheel you will need. How do you get the rear tire? BEST ANSWER: There is an option in the size selection for rear tires, depending on the size you're looking for.